Hotel Omni Mont-Royal, The American Literary Translators Association Conference, 11 am - 12:15 pm. C.M. Mayo will participate on a panel moderated by Luise von Flotow, "Anthologies: Selecting, Translating, and Then... Publishing, If You're Lucky". C.M. Mayo will discuss her forthcoming anthology, MEXICO: A Traveler's Literary Companion, a collection of Mexican fiction and prose in translation. She will also be reading from her translation of "Day and Night" by Mexican writer Monica Lavin. For more about the ALTA conference, please visit the ALTA website. 1pm -4 pm, Bethesda, Maryland, "Literary Travel Writing" special one-time three hour workshop. Take your travel writing to another level: the literary, which is to say, giving the reader the novelistic experience of actually traveling with you. For both beginning and advanced writers, this three hour workshop covers the techniques from fiction and poetry that you can apply to this specialized form of creative nonfiction for deliciously vivid effects. For more information and to register, click here.For more about the Writers Center, click here Note: C.M. Mayo will offer this same workshop again in Jan. 11th in Glen Echo Park (see listing below). 12 - 3 pm Bethesda, Maryland, The Writers Center Open House. July 19, 2005, Baja Talk Radio. Host Ted Donovan interviews C.M. Mayo about Miraculous Air. Live 1-2 pm Pacific Time; 4-5 pm EST. It's been archived -- Click here to listen in! May 25, 2005, 6-8 pm, "Translators without Borders" Third Annual Bilingual Poetry Reading Martin Luther King Memorial Library, 901 G St, Washington DC (in front of the Gallery Place Metro Stop) C.M. Mayo will participate in the bilingual poetry reading with a reading of her translation of Araceli Ardon's "It's Nothing of Mine"
February 10, 2005, 7:30 p.m. Silver Spring, Maryland, Nora School Poetry Reading Series C.M. Mayo will read with poets Michelle Giarusso and Melissa Tuckey. The Nora School, 955 Sligo Ave, Silver Spring, MD. For more information visit www.nora-school.org or call (301) 495-6672. February 2, 2005, 7 pm, Falls Church, Virginia, Stacy's Coffee Parlor. C.M. Mayo will read with Susan Burgess-Lent from the anthology edited by Richard Peabody, Grace & Gravity: Fiction by Washington Area Women. Stacy's Coffee Parlor, 709 West Broad St. Tel. (703) 538-6266. Driving from Lee HIghway, turn right on Broad and it's on the left just past Panera (on the right). Hey! This place stocks "Le Cupcakes" -- for those on the cupcake hajj, Stacy's is Mecca. November 11, 2004, 7 p.m., College Park, Maryland, Jimenez-Porter Writers House, University of Maryland C.M. Mayo will read and participate in the presentation of the new issue of Creative Nonfiction, "Mexican Voices" edited by Ilan Stavans. This issue includes Mayo's essay, "The Essential Francisco Sosa or, Picadou's Mexico City"
April 6, 2004, 5 - 7 pm Chapters Literary Bookstore 11th St NW, Washington DC, C.M. Mayo will read poetry, together with Richard Pebody and Robert Giron and others -- "on work" Sponsored by the National Writers Union. 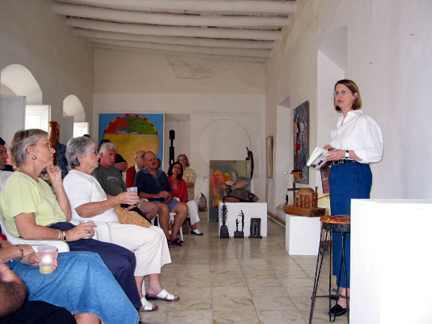 October 1, 2003, Instituto Mexicano de Cultura, Washington DC Wednesday Slide show, reading from Miraculous Air: Journey of a Thousand Miles through Baja California, the Other Mexico. 6:30 p.m.
September 4, 2003, "Our Voices, Our Images" - A Celebration of Hispanic Heritage Month Inter-American Development Bank Cultural Center, Washington DC C.M. Mayo's poems. July 4, 2002 Mexico City Mexico World-to-World Translation Workshop At the Fondo de Cultura Economica C.M. Mayo will speak about Tameme. June 23, 2002 New York City NY Literary Magazine Fair At the Housing Works Used Book Store & Cafe in SoHo 126 Crosby St New York City Sponsored by the Council of Literary Magazines and Small Presses, Literal Latte and Fence Tameme will be there! 12 - 5 pm Edited by C.M. Mayo. November 17, 2001 Miami FL Miami International Book Fair C.M. Mayo will be at the Tameme table to sign Sky Over El Nido. June 10, 2001 SoHo New York City New York City Literary Magazine Fair At the Housing Works Used Book Store & Cafe in SoHo 126 Crosby St New York City Sponsored by the Council of Literary Magazines and Small Presses, Literal Latte and Fence Tameme will be there! 12 - 5 pm Edited by C.M. Mayo. April 18-21, 2001 Palm Springs CA Associated Writing Programs Conference Book Fair C.M. Mayo will sign Sky Over El Nido at Tameme's table, 4-19 at 11:30 a.m. Look for Tameme's new issue, "Sun and Moon/Sol y Luna" featuring work by Charles Simic, W.D. Snodgrass, and Alvaro Mutis. Editor C.M. Mayo will be at the Tameme table. April 28, 2001 Bethesda MD The Mid-Atlantic Book Fair at The Writers Center 1- 5 pm 4508 Walsh St (one block east of Wisconsin Ave) Bethesda MD Look for Tameme's new issue, "Sun and Moon/Sol y Luna" featuring work by Charles Simic, W.D. Snodgrass, and Alvaro Mutis. Editor C.M. Mayo will be at the Tameme table.